Observations of the dark cloud SDC 335.579-0.292 using the Atacama Large Millimeter/submillimeter array (ALMA) have given astronomers the best view yet of a monster star in the process of forming. A giant radio telescope in Chile has captured amazing baby photos of what will eventually be a colossal star 11,000 light-years from Earth. Even more shocking: It's still growing, scientists say. The giant star, which scientists billed as a "monster star," is forming inside a vast cloud of interstellar dust that has 500 times the mass of the sun. It was discovered by astronomers using the huge Atacama Large Millimeter/submillimeter array telescope, or ALMA, in Chile's high Atacama Desert. "The embryonic star within the cloud is hungrily feeding on material that is racing inwards," officials with European Southern Observatory, a partner in the ALMA telescope, explained in an announcement today (July 10). "The cloud is expected to give birth to a very brilliant star with up to 100 times the mass of the sun." This composite shows the region around the massive star-forming region SDC 335.579-0.292 seen using NASA’s Spitzer Space Telescope and ALMA. Image released July 10, 2013. The details of the process of star formation are murky, and the new observations could help scientists understand how stars like this one come to be. One leading theory suggests large clouds of gas collapse inward, with the material at the center eventually forming one or more stars. Another theory, however, posits that large clouds first break up into smaller clouds that each give rise to smaller cores that form stars. The new results strongly support the first, global collapse theory, rather than the fragmentation theory, researchers said. "The ALMA observations reveal the spectacular details of the motions of the filamentary network of dust and gas, and show that a huge amount of gas is flowing into a central compact region," team member Ana Duarte Cabral from the Laboratoire d'Astrophysique de Bordeaux in France said in a statement. The huge star in the process of forming is just one of numerous stars being birthed by the massive cloud, the scientists said. This wide-field view shows a region of sky in the southern constellation of Norma (The Carpenter's Square). At the centre lies the massive star-forming region SDC 335.579-0.292, but this is too obscured by dust to be visible. Image released July 10, 2013. "The remarkable observations from ALMA allowed us to get the first really in-depth look at what was going on within this cloud," research leader Nicolas Peretto of CEA/AIM Paris-Saclay in France, and Cardiff University in the U.K., said in a statement. "We wanted to see how monster stars form and grow, and we certainly achieved our aim! One of the sources we have found is an absolute giant — the largest protostellar core ever spotted in the Milky Way." 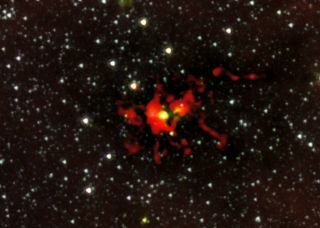 The cloud in the new study is called the Spitzer Dark Cloud (SDC) 335.579-0.292. The largest star expected to result there, with about 100 times the sun's mass, will be a very rare object: Only about one in ten thousand Milky Way stars become so large. "Not only are these stars rare, but their birth is extremely rapid and their childhood is short, so finding such a massive object so early in its evolution is a spectacular result," team member Gary Fuller of the University of Manchester in the U.K. said in a statement. Managing editor Tariq Malik contributed to this report. Follow Clara Moskowitz on Twitter and Google+. Follow us @Spacedotcom, Facebook and Google+. Original article on SPACE.com.